Everyone's talking about the Chameleon Pens. A twin-tipped marker pen with a difference, its special mixing qualities allow you to discover a range of light to dark hues, all in one pen. Perfect for fashion illustrators, designers, comic book artists and crafters alike, it's creating a stir in the world of art materials. The pens are super easy to use but it's a tricky concept to put into words - the best thing to do is to watch the video below and see how these pens work. Read on for the 6 different ways the Chameleon Pens can be used, too, which gives a little bit more detail, and make sure you get the most out of them. Take the cap off and draw normally, and the ink is as vibrant and clear as any other marker. It comes in many different colours - 20 vibrant colours which can produce over 100 different tones. Each marker includes a chamber that includes a colourless toning medium. When you touch this chamber to the nib of the pen, the medium lightens the colour of the marker. Then when you start to draw, the ink gradually and seamlessly returns to the original colour, giving you a brilliant gradient of colour. The colour starts light, and gets darker as you draw. The longer you keep the chamber touched to the nib of the pen, the longer it will take for the marker to get darker. You can use these pens on top of each other to achieve different blends of each colour. Work over the top of each colour with different variations of the infused nib. This will create new colours and tones, so you are not limited to the colours of the markers alone! The possibilites are endless. Just as you would lay down one colour using the gradual gradient, do the same thing with another colour over the top. You'll achieve a blend of one colour into another. The Chameleon Pens can be used in conjunction with other alcohol-based markers like Copic or ProMarkers. 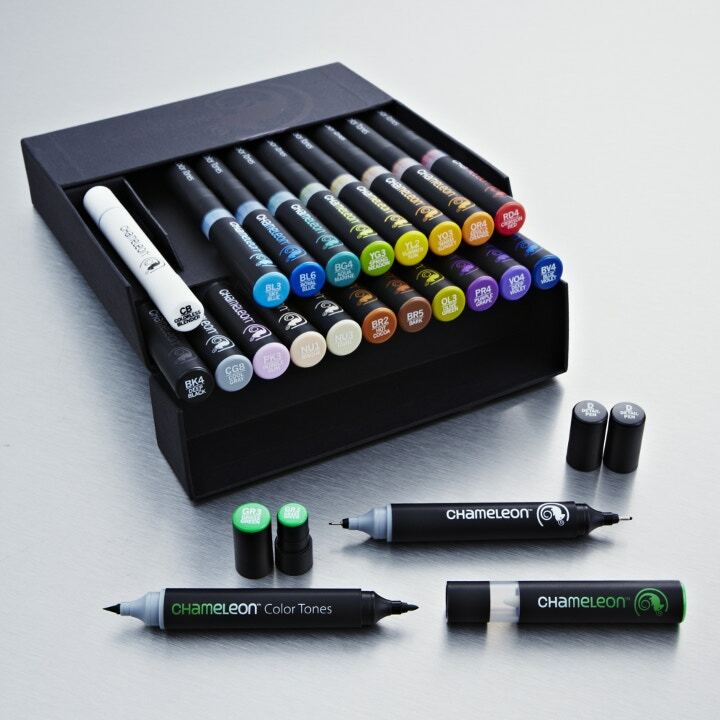 You can buy the Chameleon Colour Tones Pens as a 5-Pen pack (available in 4 different colours) or a Deluxe Set of 22.